Use ZIP Code/Census Tract demographic-economic profiles with integrated map showing patterns of neighborhood economic prosperity. See see example for ZIP code 85258. Order for any ZIP code/census tract below on this page.  Which census tracts intersect with a ZIP code of interest?  Which ZIP code(s) intersect with census tract(s) of interest?  What is the population for a census tract and ZIP code combination? The interactive equivalence/look-up table below shows a row for each unique combination of a Census 2010 ZIP code area (ZCTA - ZIP Code Tabulation Area) and Census 2010 census tract. The start-up view is sorted on the State-County-Tract column (StCtyTract). View ZIP codes in one state using the State selection button. To locate a ZIP code of interest, either use the Find ZIP query or sort on the ZIP code column and then scroll down the table until the ZIP of interest is located. There are 150,806 rows in the table, each showing a unique combination of a census tract (73,057 Census 2010 tracts) and ZIP code area (33,120 Census 2010 ZCTAs). Each row represents an intersection of the specified census tract and ZIP code area and corresponds to a geographic area of one census block or more. The total population and housing units values have been derived by summing component census block values. The sum of the population column is 308,745,538, the United States Census 2010 total population. To view maps of ZIP code and census tract areas, in context of other geography, use the CVXE GIS with shapefiles or the Census Bureau TIGER Web Map Server. 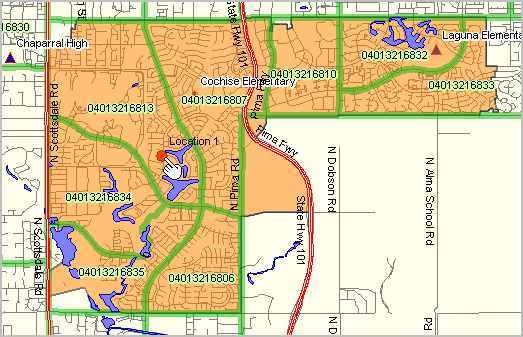 The following Phoenix/Scottsdale, AZ area view illustrates the intersection of ZCTA 85258 (orange fill pattern) with census tracts (green boundaries and geocode labels). Click Find in ZIP button below table to view only these ZIP codes and corresponding tract intersections as shown in map view. The Location 1 marker (see pointer in map) is located in the area intersecting ZIP code 85258 and census tract 2168.13 (StCtyTract=04013216813).  Get profiles for any area: census tract, ZIP code area, city, place, school district. File content as shown in the interactive table below. TractCode1 and TractCode2 are variations of the census tract code; TractCode1 is 6 characters, lead zeroes, no decimal. TractCode2 is often used to display tract codes on maps. The population and housing units counts are from the Census 2010 Summary File 1. Find ZIP. Click ShowAll button. Key in a ZIP code and click Find ZIP button (below table) to view the unique combinations of that ZIP code and corresponding census tracts. Find State-County. Click ShowAll button. Key in a StCty code and click Find StCty button (below table) to view all ZIP Codes and census tracts in a specified county. The StCty code is the 5 character code comprised of State FIPS Code (2 characters) and County FIPS Code (3 characters). The default value 04013 is state FIPS code 04 and county FIPS code 013 (Maricopa County, AZ). A list of StCty codes is provided in the county table http://proximityone.com/countytrends.htm. Find Tract. Click ShowAll button. Key in a StCtyTract code and click Find StCtyTract button (below table) to view the unique combinations of that tract and corresponding ZIP Codes. Use format structure shown in column 3 (StCtyTract code must be 11 characters). Get State and County codes from above description of Find State-County. Tract code must be 6 characters with lead/trailing zeroes as applicable with no dots, no spaces. The following 2010 ZIP Code (ZCTA) equivalence/relationship files are available. Contact us for details (888-364-7656). Go to profile form (above). Learn more about small area demographic-economic characteristics, ZIP code geographic drill-down and related analytical tools. Join us in a Data Analytics Lab Session. There is no fee for these one-hour Web sessions. Each informal session is focused on a specific topic. The open structure also provides for Q&A and discussion of application issues of interest to participants.